We are pleased to announce we have completed the transition from the ISO9001:2008 quality management standard to the new ISO9001:2015 quality management standard. The sales, service, repair, hire and calibration of industrial scales and printers. We have added a guide to the precision electronic balances section on our scalesandbalances website to help you choose the right balance for your application. The guide is designed to give you an overview of the options available and the things you should consider when deciding which balance to choose. Please feel free to call us for advice if you prefer; our friendly staff on 01842 751555 are happy to help. We now have a YouTube channel and we are gradually adding useful videos on the weighing scales, electronic balances and moisture analysers that we sell. We are also adding more amusing weighing related content when we can find it. We have added a guide to the analytical balances section on our scalesandbalances website to help you choose the right model for your application and budget. The guide is designed to give you an overview of the options available and the things you should consider before deciding which analytical balance is right for you. But if you prefer to speak to someone directly for advice, please call us on 01842 751555. Click here to see our guide on how choose an analytical balance. We have added a guide to the calibration weight section on scalesandbalances.co.uk to help you choose the weights for your application. The guide is designed to give you an overview of the options available and the things you should consider before deciding which weights you need. For telephone advice from our Sales Team, please call 01842 751555..
After many years of steady growth, we outgrew our old office and warehouse at Unit 2 Roman Way. 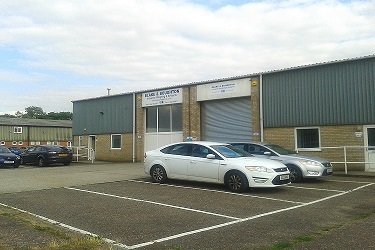 We have now moved a few doors up the road into Units 8 & 10 Roman Way. Our telephone and email contact details remain the same.